Curcumin is a naturally occurring polyphenotic compound derived from the turmeric plant. It is commonly used in many parts of the world as a spice and medical agent to treat a wide variety of ailments,1 Research has identified curcumin as the compound responsible for most of the health associated with turmeric consumption2, which include anti-inflammatory, anti-cancer and antioxidant effects.3,4. The wide-ranging biological activity of curcumin comes from its versatile molecular structure that provides the unique capacity to bind and regulate numerous biological targets. In addition to the many targets that curcumin regulates to improve overall health, curcumin also affects additional biomolecules- resulting in greater production of the muscle-building hormone testosterone, while also triggering the remarkably powerful fat-reducing process known as thermogenesis. Normal cellular function involves metabolic processes that generate oxidative stress on the cell. Research has found that increased oxidative stress within certain testicular cells, known as Leydig cells, can lower testosterone production.5 In addition, scientists have also found that certain antioxidants, such as vitamin E, mitigate oxidative stress which slows down the age-related decline of testosterone production.6 These results suggest that consumption of more powerful antioxidants, such as curcumin, may decrease oxidative stress enough to actuatly increase testosterone levels. The testosterone concentration of the gallic acid-consuming group was roughly 30 percent lower than in the control group receiving the placebo. The gallic acid group also demonstrated considerable oxidative stress based on the significant drop seen in endogenous antioxidant molecules within the testes, because they were expended while scavenging molecules, causing oxidative stress. In the group ingesting curcumin, the testosterone concentration was 260 percent higher than in the control group, demonstrating that curcumin can stimutate testosterone production. The group ingesting gallic acid and curcumin also showed an increase in testosterone of 180 percent, establishing curcumin’s capacity to overcome the oxidative stress induced by gallic acid and still increase testosterone production. Interestingly, both groups consuming curcumin showed less oxidative stress based on their normal levels of endogenous antioxidants. Furthermore, the raised testosterone level found in the curcumin-consuming groups was, in part, the consequence of increased activity of two key enzymes involved in the biosynthesis of testosterone known as 3 beta-HSD and 17 beta-HSD. The researchers concluded that curcumin reduced oxidative stress within the testes, promoting better testicular function– resulting in enhanced testosterone production. In addition to curcumin directly increasing testosterone, it also may increase testosterone in a more indirect way based on a recent study by Zhang et at.8 showing that curcumin reduced estrogen production. While all of the molecular details regarding curcumin’s ability to decrease estrogen are unknown, this lower amount of estrogen should boost testosterone levels by acting as a signal to the brain that there is a lack of circulating steroid hormones in the blood. 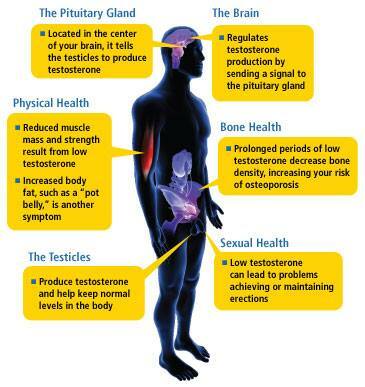 As a result, the brain will react by increasing luteinizing hormone (LH) secretion from the anterior pituitary gland, which stimulates testicutar production of testosterone. Unlike many other vitamins, vitamin D has the unique abitity to directly regulate genetic expression.9 It does this by binding and activating the vitamin D receptor, which subsequentty interacts with specific DNA regulatory elements that switch gene expression on or off. More specificaly, vitamin D has been shown to regulate the expression of several genes involved in the production of testosterone.10 Interestingly, a recent study by Bartik et al.11 demonstrated that curcumin can also bind to the vitamin D receptor and turn on the expression of several genes. Although none of the genes turned on by curcumin in this study were testosterone-producing genes, this study did not exhaustively investigate the expression of the many genes influenced by the activated vitamin D receptor– allowing for the good possibility that curcumin does, in fact, activate genes involved in testosterone biosynthesis. This is even more probable after taking into consideration the previously shown capacity of curcumin by Abarikwu et al.7 to effectively increase testosterone production. Two essential requirements to effectively promote fat loss are increased fatty acid oxidation and energy expenditure. Curcumin stimulates both of these fat-eliminating necessities by promoting thermogenesis, which uncouples the normally linked process of fat burning with cellular energy (ATP) production within mitochondria. As a result, instead of the energy from fat being used to synthesize ATP, it is instead converted into heat, which effectively increases energy expenditure. ln addition, curcumin’s energy uncoupling capacity significantly decreases ATP biosynthesis, signaling a low cellular energy state that activates the cell’s master energy regulator, AMPK. Upon activation, AMPK recharges the cell’s energy status by cranking up energy-producing processes such as fatty acid oxidation, which therefore achieves the second essential requirement for effective fat loss. Brown adipose tissue (BAT) has been shown to be the most proficient thermogenic tissue in the body because of its relatively high number of mitochondria that are loaded with the uncoupling protein 1 (UCP-1) which, as its name implies, is the protein that directty uncouples fat oxidation with ATP production and drives thermogenesis. However, since all cells have mitochondria, they do possess the ability to support thermogenesis. In fact, a study by Lim et al.12showed that curcumin can actualty uncouple fat burning with energy production, eliciting thermogenesis within mitochondria from liver cells. Interestingly, curcumin activates thermogenesis by functioning as an energy-uncoupler itself, which alleviates the requirement for UCP-1. This may be the reason that curcumin can activate thermogenesis in non-BAT tissue that do not possess significant amounts of UCP-1. In closing, the newly released fat-scorching product Thermo Heat has an exclusive blend of curcumin-like compounds, known as curcuminoids, which conceivably attack body fat and increase testosterone production in a similar manner to curcumin– and thus provide the same remarkable ability to boost fat loss while enhancing muscle hypertrophy. 1. Sharma RA, Gescher AJ and Steward Wp. Curcumin: the story so far. Eur J Cancer 2005;41, 19551968. 2. Aggarwal BB, Sundaram C, et at. Curcumin: the Indian solid gold. Adv Exp Med Biot 2007;595,1-75. 3. Abe Y Hashimoto S and Horie T. Curcumin inhibition of inflammatory cytokine production by human peripheral blood monocytes and alveolar macro-phages. Pharmacot Res 1999;39, 41-47. 4. Kawanishi S, Oikawa S and Murata M. Evaluation for safety of antioxidant chemopreventive agents. Antioxid Redox Signat 2005;7, 1728-1739. 5. Diemer T, Atlen JA, et al. Reactive oxygen disrupts mitochondria in MA-10 tumor Leydig cetts and inhibits steroidogenic acute regulatory (StAR) protein and steroidogenesis. Endocrinotogy 2003;lzl4, 2882-2891. 6. Cao L, Leers-Sucheta S and Azhar S. Aging alters the functional expression of enzymatic and non-enzymatic antioxidant defense systems in testicular rat Leydig cells. J Steroid Biochem Mot Biot 2004188, 6t-67. 7. Abarikwu SO, Akiri OF, et at. Combined administration of curcumin and gallic acid inhibits gallic acid-induced suppression of steroidogenesis, sperm output, antioxidant defenses and inflammatory responsive genes. J Steroid Biochem MoI Biot 2014;143C,49-60. 8. Zhang I Cao H, et at. Curcumin inhibits endometriosis endometrial cells by reducing estradiol production. lran J Reprod Med 2013t11,415-422. 9. Ramagopatan SV, Heger A, et al. A Chlp-seq defined genome-wide map of vitamin D receptor binding: associations with disease and evolution. Genome Res 2010;20, 1352-1360. 11. Bartik L, Whitfretd GK, et at. Curcumin: a novel nutritionally derived ligand of the vitamin D receptor with implications for colon cancer chemoprevention. J Nutr Biochem 2010;21, 11531161. 12. Lim HW Lim HY and Wong KP. Uncoupting of oxidative phosphorylation by curcumin: implication of its cetlular mechanism of action. Biochem Biophys Res Commun 2009:389. 187192.